Join us at Beaufort House Chelsea on Friday 18th August for an intimate festival experience. 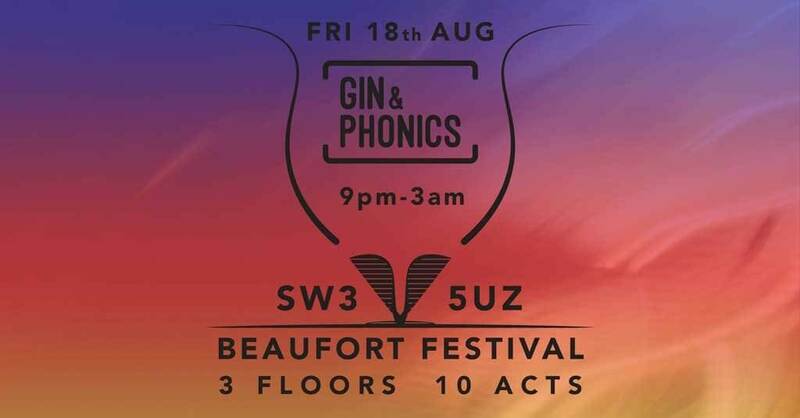 Gin & Phonics will be bringing a massive TEN genre-spanning acts to the floor in what is set to be one of their biggest events yet. A wordsmith, 2 bands, 2 DJs, and a hefty soundsystem – what more could you want. Start the night with some crafted syllables, then relax into the dulcet tones, then dance the night away. All with the cocktails flowing. Step into our private haven. With rugs and bean bags, we have got a quiet space for you just to sit and listen. With just an amp to amplify, make sure you are listening closely. Just settle into the groove. Escape the worries with some eclectic listening from two of our favourite locals. From dusk until dawn – well nearly.